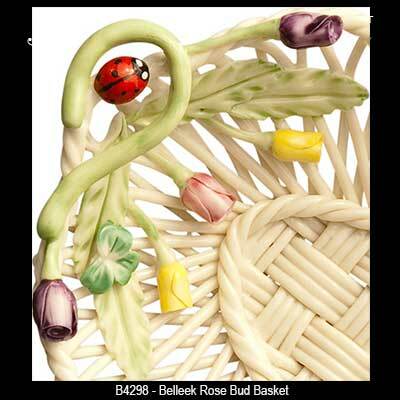 Belleek Rose Bud Basket is made of fine china that has been woven into the shape of a rose petal. The Belleek baskets typically ship directly to you from Belleek's US facility on the east coast; the delivery time is generally 5 to 7 days. This Belleek basket features blossoming roses along with a ladybug and a shamrock. The Irish basket is woven of fine china with individually applied leaves and petals. The Belleek China basket measures 3" wide x 6" long x 1 1/2” deep and it is hand painted and handmade in Belleek, Ireland. The Belleek rose bud basket is received gift boxed with a shamrock history card, complements of The Irish Gift House. 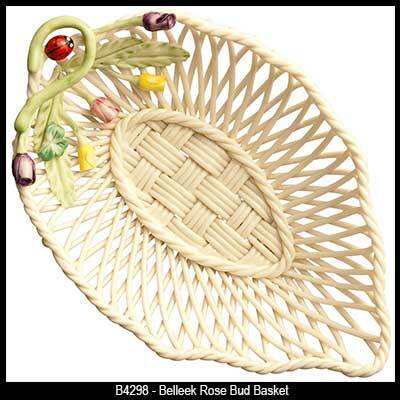 The Belleek rose bud basket is one of the least expensive baskets offered in modern time. Belleek basket features roses and Gerbera daisies that are hand applied on fine Irish china. Belleek Flowers of Spring Basket features vibrant pastel colors on hand woven china. Belleek Basket features fine woven china that is enhanced with the pink flower of the wild briar. Belleek basket with four leaf clovers and shamrocks may be the luckiest Irish china basket of them all. Belleek basket is called the rose bud heart and it features blossoming roses.